In 2002, Latin American Youth Center (LAYC) was a growing nonprofit offering a wide array of youth development programs in Washington, D.C. VPP recognized an opportunity for LAYC to expand its impact into Maryland and brought strategic guidance and funding to make it a reality. Today, LAYC serves over 4,000 individuals in DC and Maryland and is a national model among nonprofits for its practices measuring outcomes and program evaluation. Before joining VPP, Isaac Castillo worked as LAYC’s director of learning and evaluation. Lori Kaplan, Carol Thompson Cole, and Isaac Castillo tell the story. Lori Kaplan – Executive Director, LAYC: Latin American Youth Center is a multi-service youth organization. There’s academic programming, along with many holistic services around health issues, housing, violence and gang prevention, and employment assistance. Lori: Prior to VPP, the Youth Center had plans to go into Maryland underway for two years. It was very fortunate that the VPP plan came when it did. It gave us the opportunity to think it through and make it stronger. It is not so easy to replicate the youth center. Carol: VPP’s investment approach was built on outcomes and a performance-to-milestones approach; but when we started, we found that none of the organizations we were looking to invest in really had that. But LAYC created a great opportunity for us to help design something and to see what was most important in terms of outcomes and measurements. Isaac Castillo – Former Director of Learning and Evaluation, LAYC: VPP’s investment is what paid for the creation of my position at LAYC. What’s unique about VPP is that they don’t just “talk the talk” when it comes to outcomes and measurement. They put the resources behind it to make sure that the organization they’re partnering with can actually build the capacity to be able to do this stuff. Carol: The goal was to not only measure LAYC’s performance, but provide Lori with the information she needed to determine whether the organization should scale, and which programs they should scale. Isaac: I remember Lori turned to me during my second or third day and said, “I need to get a handle on the race and ethnic composition of all the youth that are accessing our 40 programs and then I need to learn where these youths live.” I was like, “Okay. This doesn’t sound too difficult,” but, in reality, I had to go to each and every one of those 40 different programs and they all had different ways of collecting the information. It literally took me two weeks to just meet with every program. But from that first chunk of data, I was able to tell Lori that 8% of LAYC youth are coming from zip codes or locations in Montgomery or Prince George’s Counties in Maryland. We should expand there because that would likely be where you would see successful expansion. Lori: I saw major changes on the demographic horizon and knew that LAYC needed to change as well. Many of our youth and families were moving to suburban Maryland, while young people and families who originally settled in suburban Maryland were coming to the LAYC seeking support. These families were living there but coming to DC for services, and we knew that things were changing and we had to look at that. Carol: VPP team members spent a lot of time at LAYC with Lori in the planning process and in implementation of the plan. Our connections with government officials and social sector leaders in Montgomery and Prince George’s Counties, and others in the field, allowed LAYC to meet the key players and speed along their process of expansion. We also focused a great deal on governance structure and the diversification of funding sources for the organization through introductions to like-minded philanthropists. Lori: I think there were a lot of very honest and upfront conversation to really figure out what the relationship was and how the partnership would work. VPP was an investment partner. It really is a two-way conversation and not a traditional power-dominant, one-way conversation. Carol: LAYC was part of our first portfolio of investments, but when we launched our new program, youthCONNECT, we brought them along as part of that network. The relationship has really become a longstanding one. Together, we’re putting a dent in the problems that these young people face and we want to get better, to serve them better. Isaac: Throughout my career, I’ve come in contact with hundreds of nonprofit organizations. Even today, there are many nonprofits that don’t make measurement and evaluation a priority. They don’t elevate it to a level where it’s someone’s job. VPP is one of the few funders out there that is willing to put in the kind of resources necessary to make sure that this work happens in a sophisticated and sustainable way. 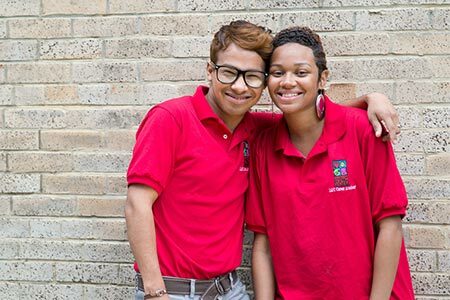 Latin American Youth Center empowers a diverse population of youth to achieve a successful transition to adulthood through multi-cultural, comprehensive, and innovative programs that address youths’ social, academic, and career needs. A multi-year strategic investment and partnership with Latin American Youth Center would provide the capital and strategic assistance necessary to guide the regional expansion of its DC-based, multi-service organization. VPP had an opportunity to play a significant role in supporting a well-respected community leader to effectively expand programs and services to needy populations in Maryland. The partnership with other regional stakeholders could serve as a model for the successful expansion of support services, across geographic boundaries, for the neediest populations of the Region. Planning and Focus: Completed business planning in April 2004, facilitated by Monitor Group, resulting in a well-defined expansion plan for Maryland and the demographic data needed to make strategic choices about service provision. Greatly strengthened senior management team, integrating Maryland managing director, DC managing director, CFO, director of development, and learning and evaluation specialist. Better defined processes and utilization of staff across sites and charter schools as organization expands. Good board strengthened by addition of strategic members. Advisory board with local expertise and network created for Maryland expansion and also coordinated with charter schools. Capitalization/Revenue: Raised approximately $2 million for Maryland expansion over one year from multiple sources, including local foundations, federal earmarks, public funding, and individual donors. Most notably, leveraged federal appropriations totaling $950 thousand, up from $100 thousand in the previous two years. Outcome Assessment: Extensive outcomes assessment system designed and established for managing 40+ programs under the leadership of a full-time learning and evaluation specialist.